“Thank you for Tony Collman’s article about Bert Jansch and John Renbourn, two legendary musicians I did not know were go players,” writes Steve Burrall. 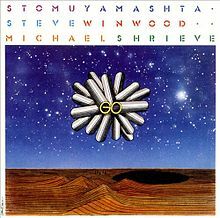 “Another go connection in music is ‘Go’ by Stomu Yamashta (actually Tsutomu Yamashita), Steve Winwood and Michael Shrieve. In 1976 the Japanese percussionist Tsutomu Yamashita formed what is generally considered to be a ‘supergroup’ owing to having musicians from Traffic, Santana and Return to Forever; the name of the group as well as the name of the first recording was ‘Go’. While not explicitly about the game of go, the influence of the game is quite clear in some of the songs. 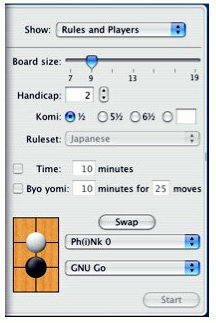 Yamashita is quoted as saying that ‘it’s a game of chance, random and abstract, with few rules. It’s also about opposites colliding, reality and fantasy shifting into one another, re-birth through suffering, and defeat turned to victory.’ Those with an interest in the confluence of jazz, rock music and classical music are likely to find it to be a very beautiful music journey.” -Graphic from the Wikipedia page for the album. 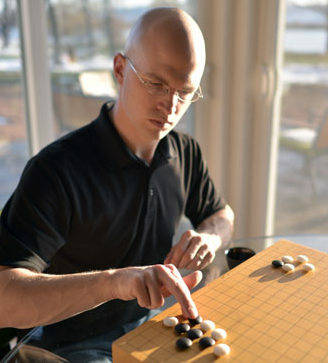 Fotland’s Freebie: “Many Faces of Go creator Dave Fotland has created Igowin, a great little freebie that plays on a 9×9 board, and, when you get to the 1-2 dan level, is difficult to beat,” reports Peter Freedman. 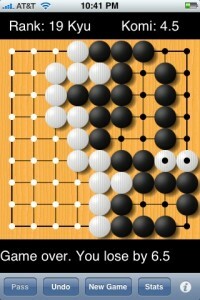 “I think it’s strength goes up to 5 dan.” Download Igowin here . American Ing’s New Website: American Ing reports that they’re moving to a new web page. The Ning website will go down July 1st. Your Move/Readers Write: Power’s Wrong Order? 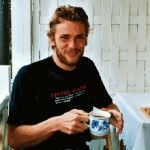 In addition to GNU Go, Ke Lu suggests PANDA-glGo; they’re both available on the IGS Pandanet site. Peter St. John flagged Wikipedia’s listof computer go playing programs and of course there’s always the AGA website’s go software page. There was also a response posted in the AGA Google+ Community (which now has 164 members) from Ryan Case, suggesting Sen:te software.